We attempted to determine the contribution of entrapped gas bubbles to the soil methane (CH4) pool and their role in CH4 emissions in rice paddies open to the atmosphere. 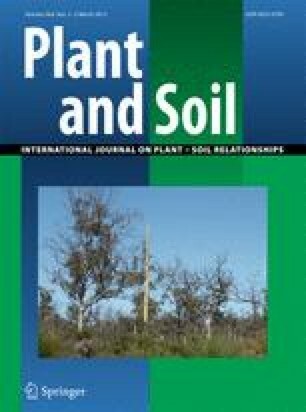 We buried pots with soil and rice in four treatments comprising two atmospheric CO2 concentrations (ambient and ambient +200 μmol mol−1) and two soil temperatures (ambient and ambient +2 °C). Pots were retrieved for destructive measurements of rice growth and the gaseous CH4 pool in the soil at three stages of crop development: panicle formation, heading, and grain filling. Methane flux was measured before pot retrieval. Bubbles that contained CH4 accounted for a substantial fraction of the total CH4 pool in the soil: 26–45 % at panicle formation and 60–68 % at the heading and grain filling stages. At panicle formation, a higher CH4 mixing ratio in the bubbles was accompanied by a greater volume of bubbles, but at heading and grain filling, the volume of bubbles plateaued and contained ~35 % CH4. The bubble-borne CH4 pool was closely related to the putative rice-mediated CH4 emissions measured at each stage across the CO2 concentration and temperature treatments. However, much unexplained variation remained between the different growth stages, presumably because the CH4 transport capacity of rice plants also affected the emission rate. The gas phase needs to be considered for accurate quantification of the soil CH4 pool. Not only ebullition but also plant-mediated emission depends on the gaseous-CH4 pool and the transport capacity of the rice plants. We thank Mr. H. Iino and Mr. H. Kamimura of the Field Management Division of the National Institute for Agro-Environmental Sciences (NIAES) for technical assistance with pot preparation. We also acknowledge Ms. M. Kajiura and Dr. N. Katayanagi of NIAES and Dr. M. Matsushima of Chiba University for help with flux measurements and Drs. S. Sudo and K. Minamikawa of NIAES for assistance with the GC analysis. This research was financially supported by the Global Environment Research Program, Ministry of the Environment, Japan, and a Grant-in-Aid for Scientific Research (PD 19-7010) from the Japan Society for the Promotion of Science.